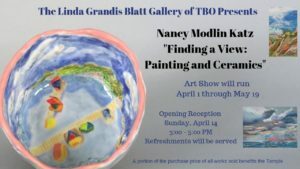 Art Gallery Reception Join us on Sunday, April 14, at 3:00 PM for the opening of Nancy Modlin Katz’s show, “Finding a Veiw: Painting and Ceramics.” Refreshments will be served. We hope to see you there! This entry was posted in Uncategorized on March 21, 2019 by Kim Lefferts.